The Orange County Animal Shelter is responsible for providing humane care to animals entrusted to us, consistent with State regulations and policies. Animal Control Officers are employed by the Orange County Sheriff's Office, to enforce all State laws and any County ordinances for the protection of domestic animals. If you have an animal emergency or stray animal, please contact Animal Control at (540) 672-1200. 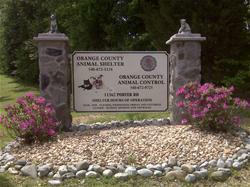 The Orange County Animal Shelter sponsors low-cost vaccination clinics every spring and fall. Rabies and distemper shots are available for both cats and dogs. These clinics are open to everyone, regardless of county of residence. Please ensure that dogs are safely secured on leash and cats are either harnessed or in an appropriate carrier. How do I reclaim a lost pet? How do I relinquish a pet?